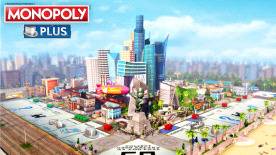 • A full 3D city at the center of the board lives and evolves as you play. You own a miniature world where each neighborhood has its own unique identity and characteristics. Its friendly inhabitants will interact with your progression throughout the game and celebrate your achievements, bringing a new dimension to your experience. Feel that you own something special and admire your empire grow right in front of your eyes! • You can change the rules and adapt them to your playing style. Play the famous Speed Die mode to spice up your game or select from a catalogue of 6 house rules chosen by Monopoly community members from around the world! LEGAL: The MONOPOLY name and logo, the distinctive design of the game board, the four corner squares, the MR. MONOPOLY name and character, as well as each of the distinctive elements of board and playing pieces are trademarks of Hasbro for its property trading game and game equipment and are used with permission © 2017 Hasbro. All Rights Reserved. Licensed by Hasbro to Ubisoft Entertainment. Ubisoft and the Ubisoft logo are trademarks of Ubisoft Entertainment in the U.S. and/or other countries. Games software © 2017 Ubisoft Entertainment. All Rights Reserved.